Longest one to date – 14K … and just 3 weeks into training. Been reading lots, getting advice from runners wiser than me, and today took to heart slowing down, running farther! I even felt as if I wasn’t slowing down enough – next time I’ll try reigning myself in even more. I must say, I’ve never had such a GREAT GREAT run in a long time! I stumbled upon a path I wasn’t aware of, and being all alone, felt so quiet and peaceful, the sun shining in my face … I kept thinking, “I hope this path goes on forever, I ain’t getting off” … I swear, I woulda ran forever! It felt THAT good, I felt THAT good! I think it ended after 1 kilometer, so back to the sidewalks I went. I knew I’d be stopping as I neared my house, so NOW, I picked up my pace in anticipation … and for those few kilometers, running once again became running for time, and it became harder! So weird, it’s not even that much pace difference, but boy, do you feel it – sure makes a difference! And now, can’t help but think, today I ran 1/3 marathon … so invariably I extrapolate multiplying my time by three – plus tacking on 1 minute for the extra 200 meters, and I kinda like what I see. And I think, there’s still so much room (ok, a LITTLE room, lol) for improvement. I know marathons aren’t run on paper, they’re run on the streets … but, it sure is nice to think! 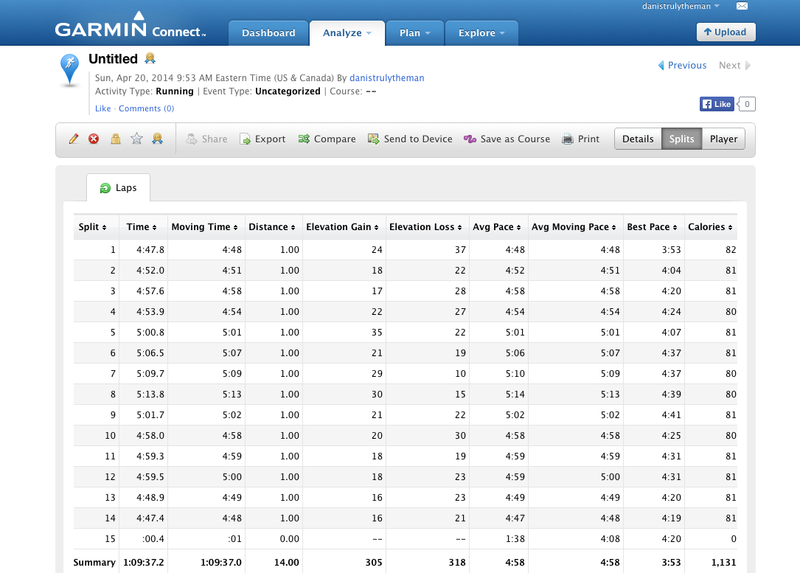 Categories: running | Tags: 14K, Garmin, Garmin Forerunner 610, long run, marathon, numbers, running, training | Permalink.